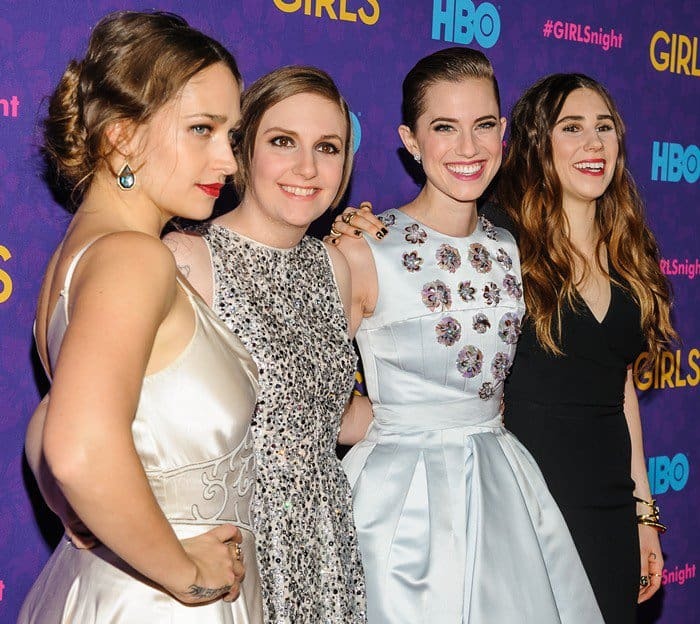 Allison Williams joined Alex Karpovsky, Jemima Kirke, Lena Dunham, producer Judd Apatow, and Zosia Mamet for the premiere of the third season of ‘Girls’ on Monday. The 26-year-old American actress, comedienne, and musician donned a cute blue silk-leather-and-satin cocktail dress by Dior featuring a bodice decorated with sequined flowers, a pleated skirt, and a rise-and-fall hemline. The Yale-educated actress accessorized with diamond jewelry pieces by Dior and a gorgeous pair of asymmetric-cut pointy-toe pumps by Christian Dior featuring perspex heels. How do you rate Allison’s outfit on a scale from 1 to 10?